"A substantional help anytime "
Definitely the best part for me about this software in particular is that you have an online help anytime anywhere you need it and you have more than 30 languages to choose from. It helps you translate everything automatically and the best part or feature, is that you can also translate a complete document or website, that's something beyond expectations for sure. A major plus is that you can download your translations as well! For me it accomplish all the things I look for in a software like that! It's simple to use and amazing the help it can provide. If I need to translate in a really short period of time some document this is my right hand, this really helps me to optimize my time and make me more efficient, of course I read and verify all of it but it's way faster the process with its help. "Still too far away from a natural translation... "
Main interface is easy and handy to use. There are lots of language pairs. The new English to Catalan in the 2.0 motor version provides poor quality results. A powerful translation platform covering lots of language pairs. Very handy. Technical texts can be easily handled in the platform. 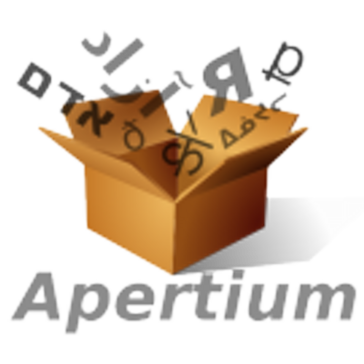 * We monitor all Apertium reviews to prevent fraudulent reviews and keep review quality high. We do not post reviews by company employees or direct competitors. Validated reviews require the user to submit a screenshot of the product containing their user ID, in order to verify a user is an actual user of the product. Hi there! Are you looking to implement a solution like Apertium?